Wedding Suits; the hottest ones this year! Weddings. Everyone had their ideal wedding, but some things pop up more than others. A big cake, a white dress (more on this later,) hand-written invitations, and pretty flowers are just a few. Another thing that comes up often (not as often as dresses though,) is tuxedos. But seeing increasing surges of popularity every year lately, is wedding suits. No, you didn’t read that wrong; wedding suits. Wedding suits are exactly what they sound like: suits that someone wears to a wedding. And no, I’m not talking about the clothes the guests wear. I’m talking about the actual groom’s wedding duds. No one knows exactly why, but more and more brides are seeing fit to put their grooms in suits for their wedding. Designers and manufacturers are quickly taking notice. And so as a result, there are more options than ever for good wedding suits nowadays. Looking for the most popular wedding suits? Look no further. But as you flick through Pinterest for ideas for your own wedding, you’ll surely come across some suits quite often. These are the champions that stand out among the others as the most popular wedding suits. I’ll be going over them generally, by color and by fit. More descriptive lists can be found in future articles. Notice the narrowed shoulders, fitted pants and slight taper in the waist area; all qualities of a fitted wedding suit. Generally, the most popular wedding suits all seem to follow one trend in particular: they’re all fitted suits. Fitted suits have swept the world and replaced standard cut outfits as the go-to for that modern look. And for good reason: a fitted outfit is a great way to really bring out the good qualities in a person’s physique. Now here, I’m not talking about vest, tie or shirt colors. I’m talking about the actual colors of the wedding suits themselves. 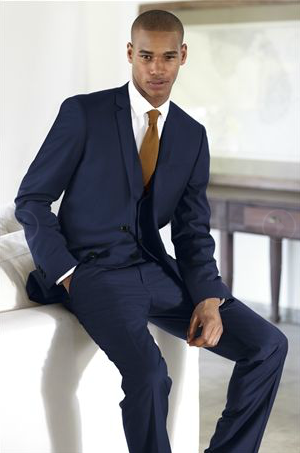 A typical blue wedding suit; somewhere between navy and cobalt blue. Suits can be seen in just about any color you can imagine. This is especially true since people sometimes use suit colors to stand out. These people will go for something that jumps, even if it doesn’t necessarily look good, like bright orange (Kraft Punk, anyone?) or also pink. But by and large, for people serious about their wedding the most popular colors remain the same. Tones like dark grey, light grey, navy blue, cobalt, and even tan are quite common. Black suits aren’t as desirable as they used to be; these are more favorable for funerals or business meetings. These are some of the more popular wedding suits. But it’s your wedding; go with whatever feels best! 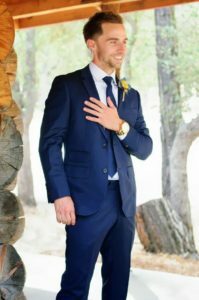 What kind of suits would you like to see at your own wedding? Let us know in the comments below! Fitted tuxedos; the new normal in tuxedo coats!